I often say how happy I am when I get a song for the day’s message. If I am honest, today would be an exception. While I love the words to this song, I do not like song. I don’t like it because it is one of those melodies that just keep going through your head like a stuck recording. You just can’t get rid of it. But again, if I am honest, there is no better song to represent the message for me. 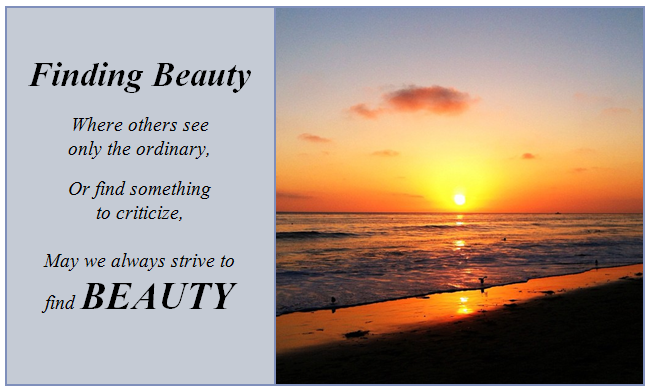 Our message today is that there is beauty in all things….in all people. In the humble, in the ugliest of days, in the meanest people, in the saddest moments, in the most ordinary etc., there is beauty. It is up to us to know this. It is up to us to expect and, if necessary, dig for it. For me, this song is a perfect lesson/example of today’s message. I had to get past the melody to see and feel the beautiful lyrics…the powerful words. Today’s message is not always easy but we are up for the challenge. -Look for the beauty including in yourself. -Absolutely pure joy. I took my 3/4 th graders out for a morning recess. Last week the wind chill made it too cold and then there was no school for a couple of days so this was the first time they had been out in a week. To make it even more perfect there was 3-5″ of fresh powder snow on the ground and…….NO ONE HAD MADE ANY MARKS IN IT YET…..until we got there. Snow angels, body sledding and snowballs were too much fun. -Ginger and I went to lunch and then to see Aunt Dorothy. Yes, she is thinner she eats very little, but she was happy to see us, happy for the flowers and magazines we brought her….totally interested in them. She was content, comfortable and in good spirits. When you are one month shy of 100 years old, this is good. -A happy Alex. Happy with her flight and a funny email describing it. -I made potato soup for dinner with cheesy biscuits. Bruce, thinks I am a culinary wonder. See….he sees the beauty in the small things.